It’s 6:30am. I’ve been in France almost three weeks, half a week to go. I’m a walking illustration of so many of the Buddha’s teachings. (greed, hatred and delusion, or, if you prefer, lust, aversion, and confusion). You’d think it would drive me to a buddhist nunnery. I don’t think it will. Buddhism as a religion is making some progress recognizing women’s worth, but it’s still mega-patriarchal. Patriarchy happens to be one of my bigger issues with our species. Comfortable beds and pillows are another issue I hold dearly. I freely admit to my princess-and-pea-goldilocks nature. I have not found one good bed in France. Here in Uzes, I have two sleeping choices. The bed. Hard and narrow. An Ikea comforter meant for Swedish winter temperatures. It’s not even close to that cold here. The comforter is also heavy and falls off me and the bed at every whisper of a turn. 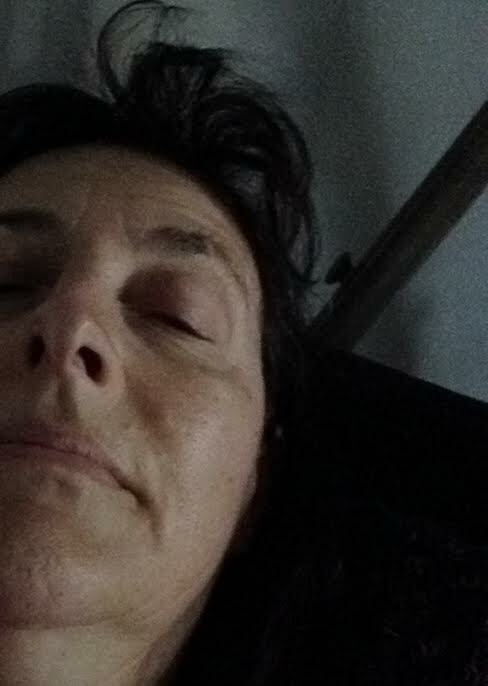 After two nights with the bed and severe morning backaches I said adieu, and turned toward the couch. A chaise longue kind of affair (chaise lounge in American), a few millimeters wider and softer but shaped, so that I sleep either bent at the hips (semi-sitting up), chest, or neck, depending on where my body has slid down to at the various points of awakening. In the middle of the night or pre-dawn darkness, I watch the many-paned windows shape shift shadows on the wall. I can see this because my eye-mask which has blocked the light from the street lamp to help me sleep has of course slipped off. The ear plugs which keep out various sounds are causing my ears to feel itchy and claustrophobic and me to feel like I’m in a diving bell. On the sixth night of this, I want to kill my bed. I remind myself (several times over) that it is an inanimate object and that this is a seriously foolish thought to be thinking. That does not stop me from thinking it. Then, I have to spend some time thinking negative thoughts about myself for thinking about killing the bed. I know it’s ridiculous. All of this. Depending on your viewpoint, and whether you worry for me or find me amusing, you might see the humor in this, or the tragedy. I’m hoping you will see the humor. Your laughter helps. My “office” (henceforth referred to as my office, without the quotation marks), is Outside the tourist office (whenever the tourist office is closed —mornings ’til ten, long lunches, and evenings). It is actually just a cold concrete bench. To get to it, I go down two flights of the winding staircase, out the ancient heavy wooden door, through the outside tables of the next-door creperie, across the alleyway, and one more small store. Fortunately, except for the bench, it is not too cold outside, and the rains aren’t coming til tomorrow. The people here are so nice, it doesn’t feel dangerous to be sitting outside with my laptop, even in the dark. The wifi connection is always bad, sometimes better or worse, never what I’d call good. My office is a few precious feet out of range of the tree canopy and the literally thousands of birds living in it. Every night these birds (ALL of them) do a wild, raucous sky dance just before the sky goes dark. Most of the rest of the time, they are sitting in these trees, squawking and dropping poop on whatever is below. I try not to be. 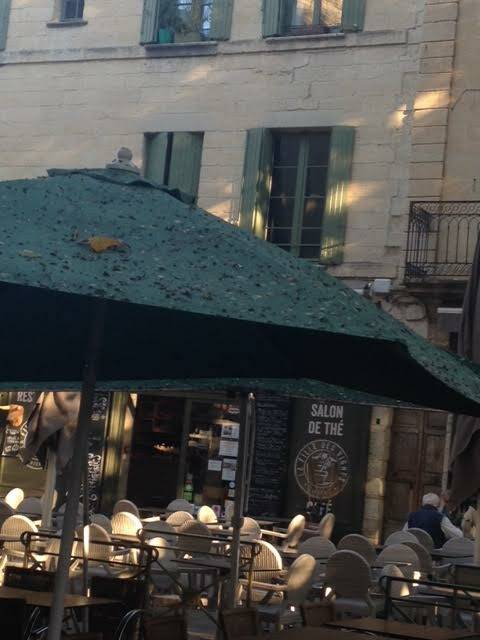 Uzes is uber-clean, but so far I haven’t seen the bird poop get cleaned up outside my office space, or off the umbrellas that cover the cafe tables a few meters from my office. 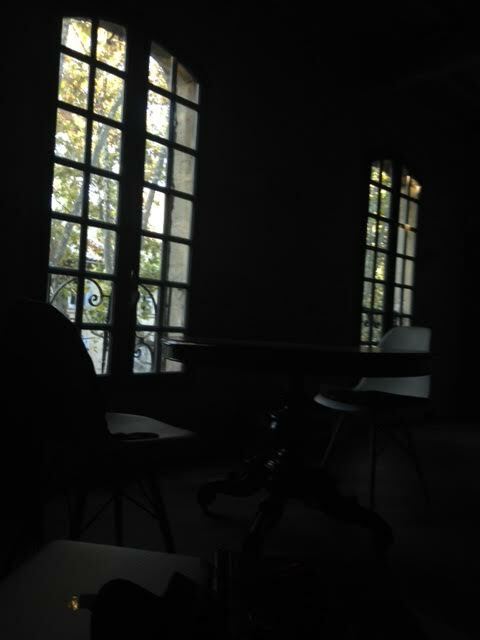 Last night (after being away all day at Rousillon), I went to my office around 9 o’clock. Instead of sitting on the cold concrete bench, I decided to sit at one of the cafe’s chairs and tables, under an umbrella to do my office “business”. The place was empty. I thought, hoped the cafe was closed, but twice someone came out and asked me if I wanted anything. Clearly I was not a paying customer. Both times when I looked up startled and guilty, (ready to be hauled off to jail, or at least scolded) they smiled. I don’t know what their actual words were, but they let me know it was fine to stay and use their cafe as my office. The people here, the French people, have been nothing but nice. In every kind of encounter. I don’t know why some people give them a bad rap. ps. Thursday morning before Tourism office hours, someone washed away the bird poop on the ground (not on the umbrellas). Four teenage girls were sitting on MY office bench. I guess they didn’t know. Also Friday night, I finally got One Good Bed at my friends’ house in the country. One good bed for one night. Yay! Previous Previous post: Perfect. Not perfect.